I have been wanting to give the deck a playhouse for years. I have a particular aversion to the plastic variety, but always felt that anything made of wood was far to expensive to buy and much to difficult to make. 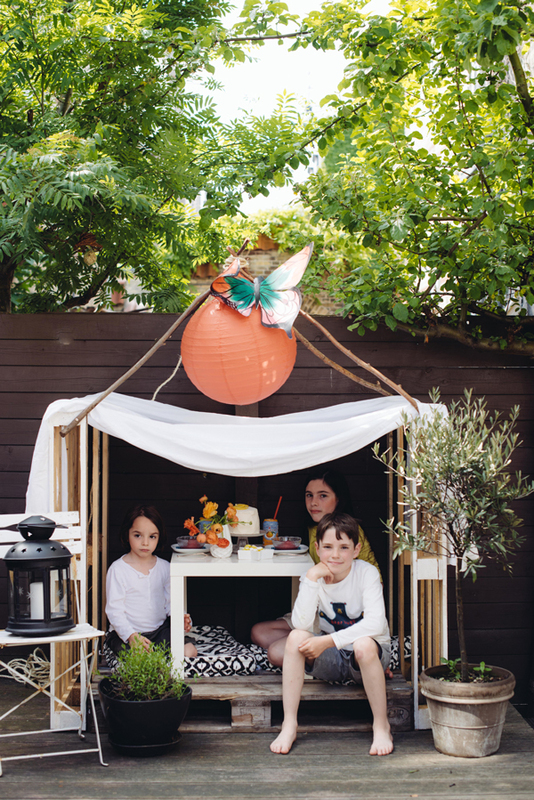 Recently, we created a summer playhouse that the kids can enjoy, we can lounge in, that is affordable, easy to build, and beautiful! This house can be made using jus?t three wooden pallets and a few basic tools and supplies. 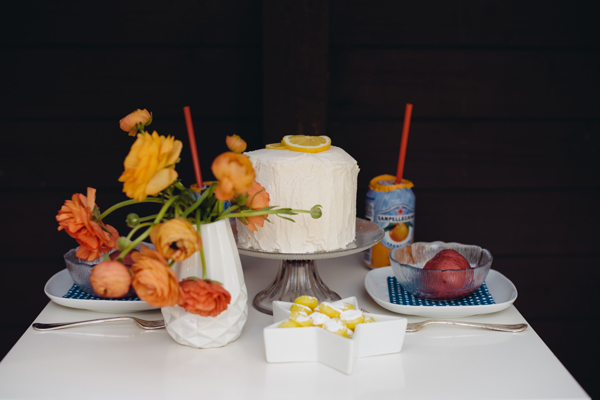 To celebrate the beginning of summer and our new house on the deck, we threw a little party complete with lemon pound cake, Sparkling Orange Pellegrino, and raspberry sorbet. Stability is the key to this project! Make the simple pallet play house by first laying one pallet down as your base and two perpendicular for the sides. Attach strong L-brackets to where the base and sides intersect. We also put extra screws in the sides and base for additional security. 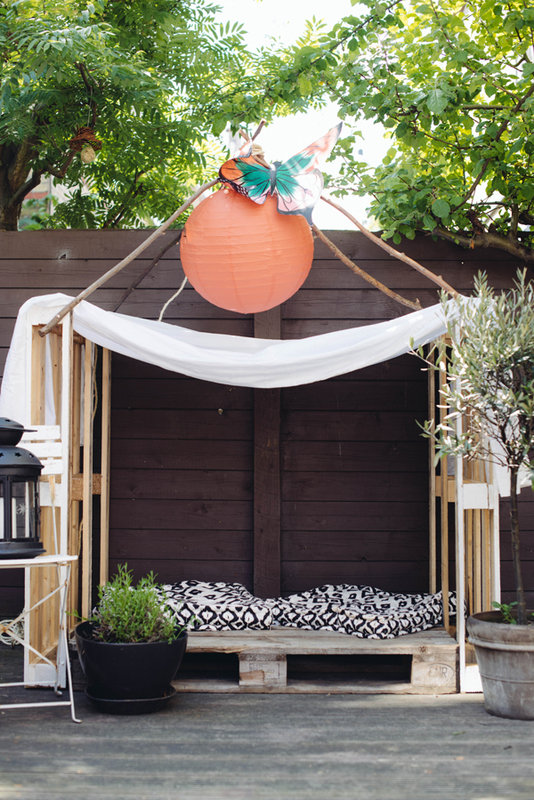 Paint the pallets if you choose, and drape fabric across the top for a simple, stunning outdoor structure. To add a bit of drama to the play house, screw branches to the outsides of each of the four corners, angling them to the center. Wrap a strong rope around the branches in the center and decorate the top with lanterns for light. What a cool way to use pallets! I will pass this on to my friends/cousins who have kids that would enjoy a fun spot like this! 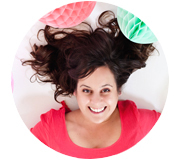 :) Saw your link on the Ingenious Inkling blog today. I really need to do that since mine is practically falling apart! Thank you for this article and all your recommendations and resources. That’s such a simple and easy idea with pallets and easier to move than traditional playhouses! OMG! So cute idea! I just back my childhood memory. To build my kids memorable childhood like me, I want to make this DIY pallet playhouse.Thanks for sharing the really awesome idea. I just love it. Amazing ideas. I just loved it specially pallet playhouse ideas. I think it will be great fun for my kids. I want to make like this playhouse for my kids backyard fun. Thanks for sharing.